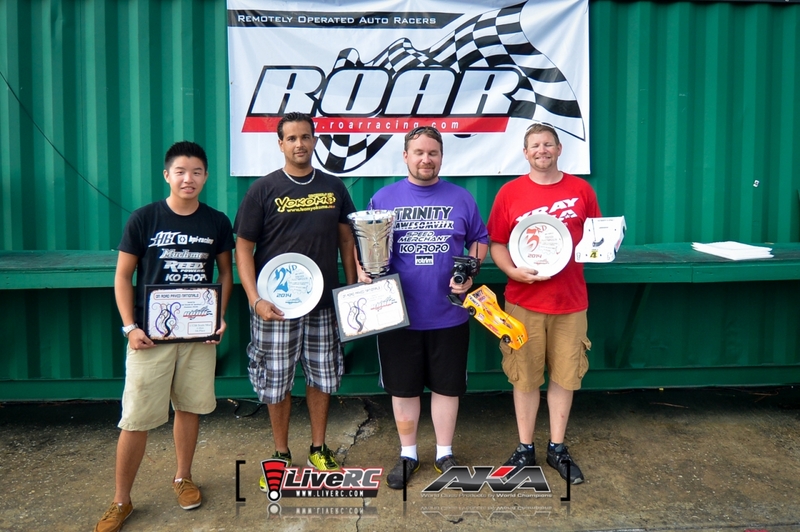 Last weekend at Full Throttle RC Raceway in Apopka, FL, Josh Cyrul earned the ROAR 1/12-scale Modified National Championship. It was the 36th time that 1/12-scale was recognized for an official U.S. National Championship. There's no denying that the RC10 radically changed the world of off-road racing forever when it debuted in 1984 - and promptly swept the first-ever ROAR Nationals for off-road racing, but the RC12e did the same thing for on-road racing seven years earlier. Five years after entering the 1/8-scale nitro on-road class in 1972 and absolutely obliterating the class (in fact, the first RC1 was outlawed because it was that far superior to everything else on the track), Team Associated founder Gene Husting went searching for what he thought would be the next big trend in RC racing - and found it in the 1/12-scale on-road class. At the ROAR On-Road Nationals in 1977 at R. Rattey's Raceway in Massachusetts, which until that time was only for 1/8-scale nitro, a demonstration class was held for newly created 1/12-scale electric powered cars - and Team Associated's new RC12E design crushed the competition. When the class was officially recognized in 1978, Team Associated won three of the four classes offered as RePete Fusco won 6-cell stock, Arturo Carbonell won 6-cell modified, and Curtis Husting, the son of Team Associated co-owner Gene Husting, won the 4-cell modified class that went on to become the premier division. 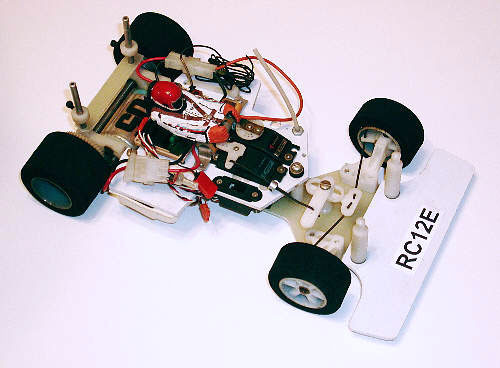 In 1979, the RC12E won all four classes that were offered that year. 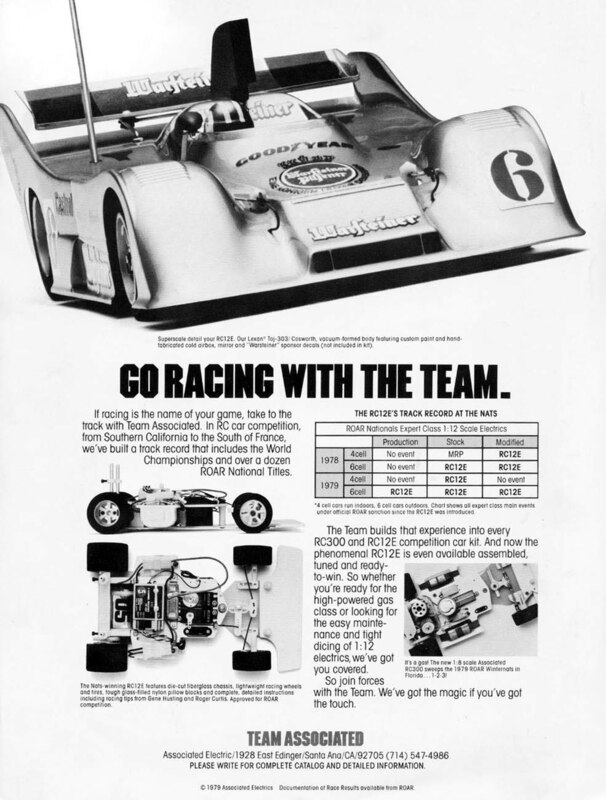 To celebrate the achievement, Team Associated created the following advertisement touting the car's racing pedigree. Oh, and in case you're wondering: the RC12E showed no signs of slowing down after that. Mike Lavacot drove the RC12E to three straight National Championships in stock from 1980-1982, and Kent Clausen won the Modified class titles in 1980 and 1982, then added the first ever IFMAR World Championship for the class in 1982 as well.